This bespoke panel was made for a beautiful London townhouse. 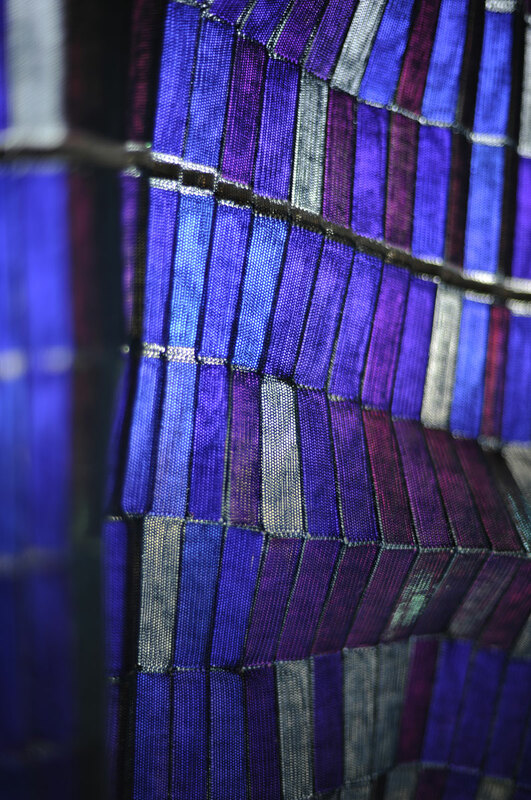 Dark maroon yarn embeds iridescent acrylic tiles that when backlit gently shift colour from purple to gold. The fabric is stretched in a black wood surround measuring 120cm x 100cm. 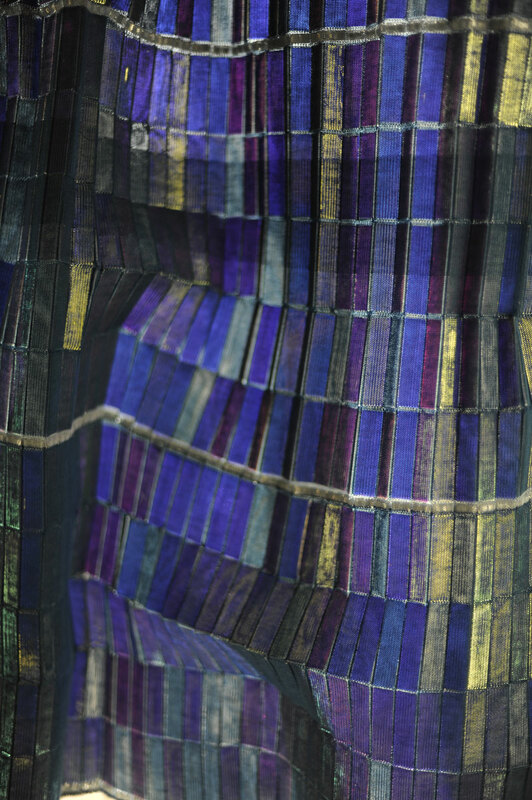 These images capture the shifting colours of the iridescent acrylic tiles within the fabric. An immersive new installation created by myself and multifaceted designer Kia Utzon-Frank. Selected by the Crafts Council to appear at the international art fair Collect Open. 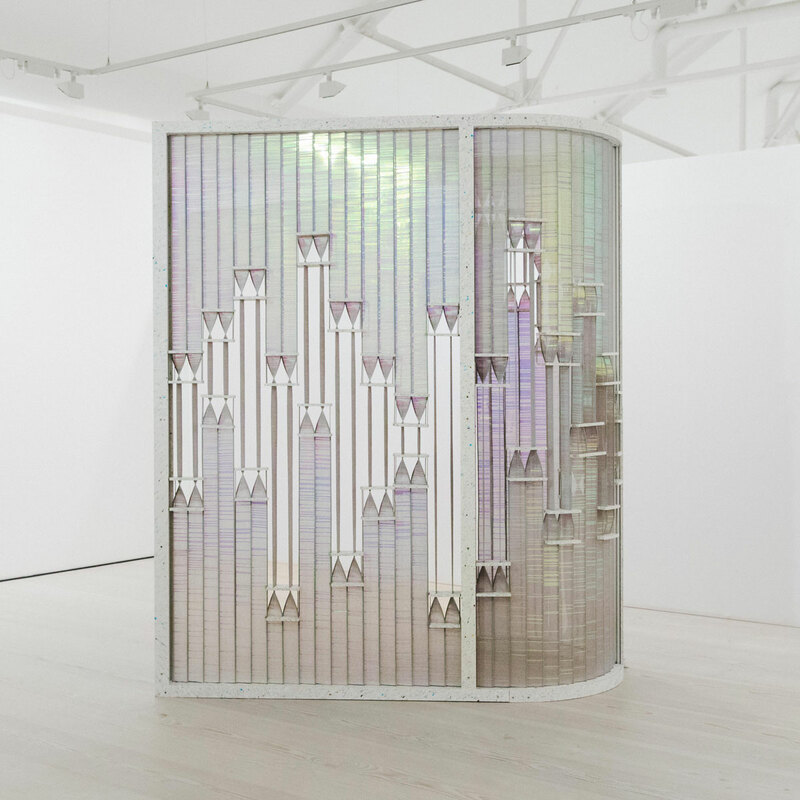 Our gallery-filling piece Curved Twist is a monumental colour-changing screen that combines both our expertise to create an immersive, interactive and entirely new expression of art, craft and design innovation. 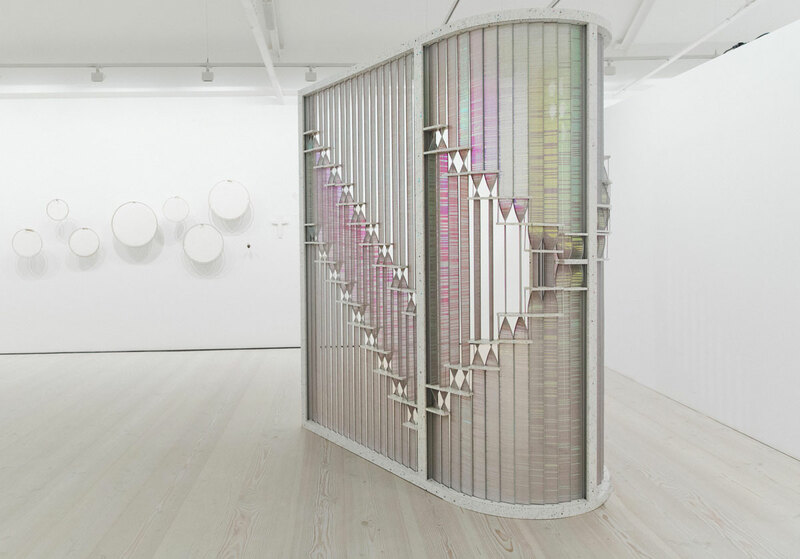 The plastic modules slide up and down the knitted slats twisting them from open to closed, enabling the screen to be used as a functional blind system or changeable partition. 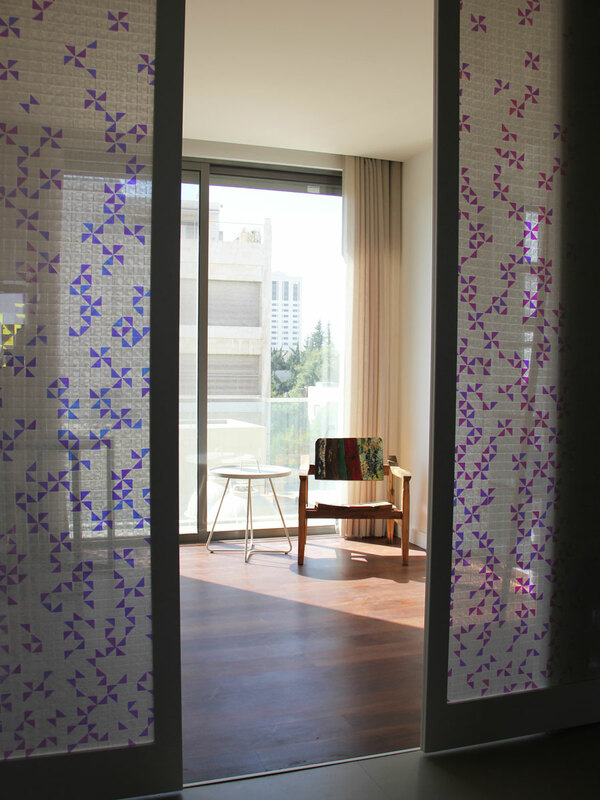 This modular wall covering consists of 25 handmade textile tiles measuring 40cm x 40cm. 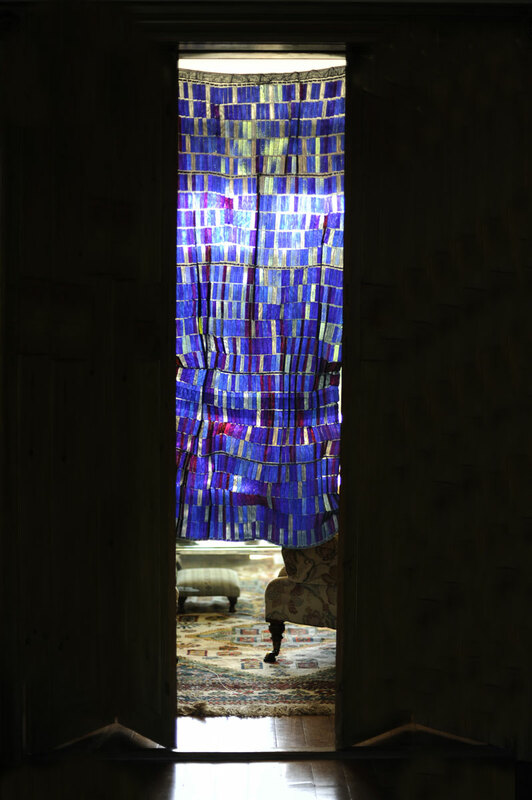 To create the piece hundreds of metallic shapes were arranged in an arabesque inspired pattern and embedded between a layer of cotton fabric and fine netting. A wall panel measuring 80cm x 180cm. To create the piece, thousands of copper and brass shapes were arranged in an arabesque-inspired pattern under a layer of fine knitted cotton, resulting in a subtly gleaming surface that has been formed into a three-dimensional structure. 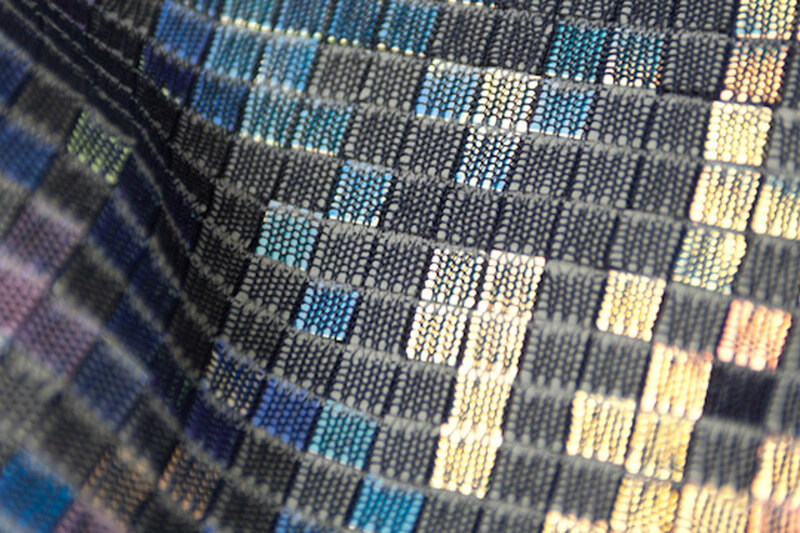 Aqua Surface is a beautiful shimmering, pearlescent fabric. 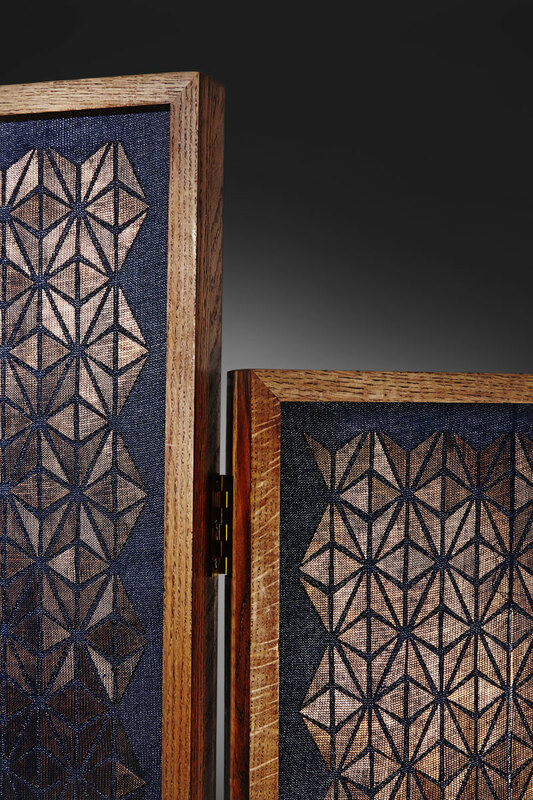 It can be used for drapes, wall coverings, room divider screens or simply as a decorative panel or installation. These cushions were made at the special request of a private client. 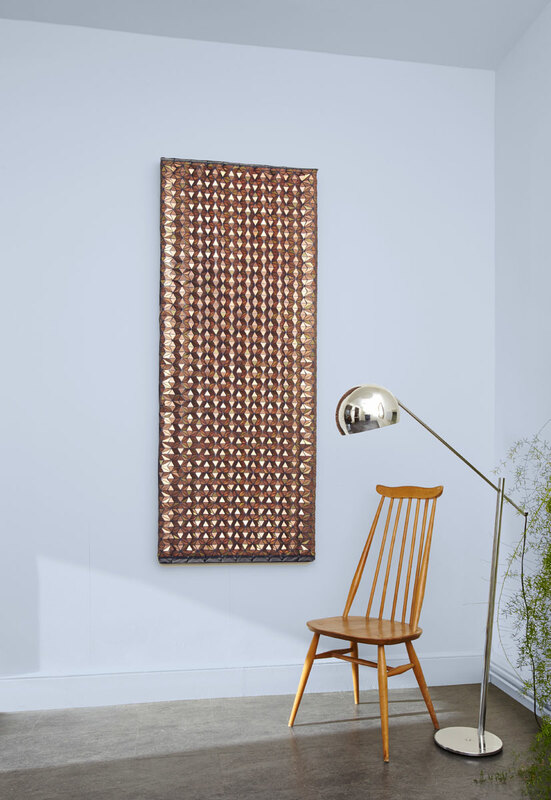 Delicately knitted maroon yarn embeds small mirror tiles that reflect and shimmer in response to light. 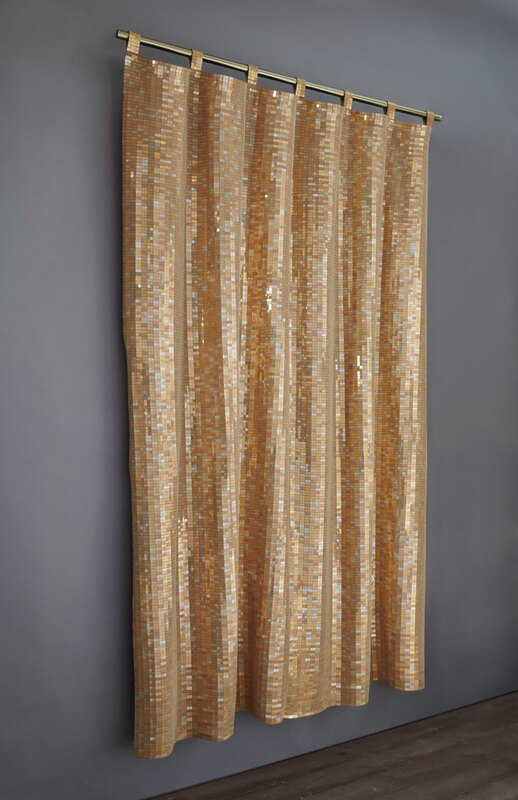 Aura Tapestry is a luxuriously glinting wall covering. The pixelated arrangement of gold, copper and silver tiles embedded within delicate cotton yarn, shimmers in response to movement and light. The tapestry measures 155cm x 240cm but can be commissioned to any required size. The biggest project to date, these two handmade panels measure six metres in length by three metres in width. 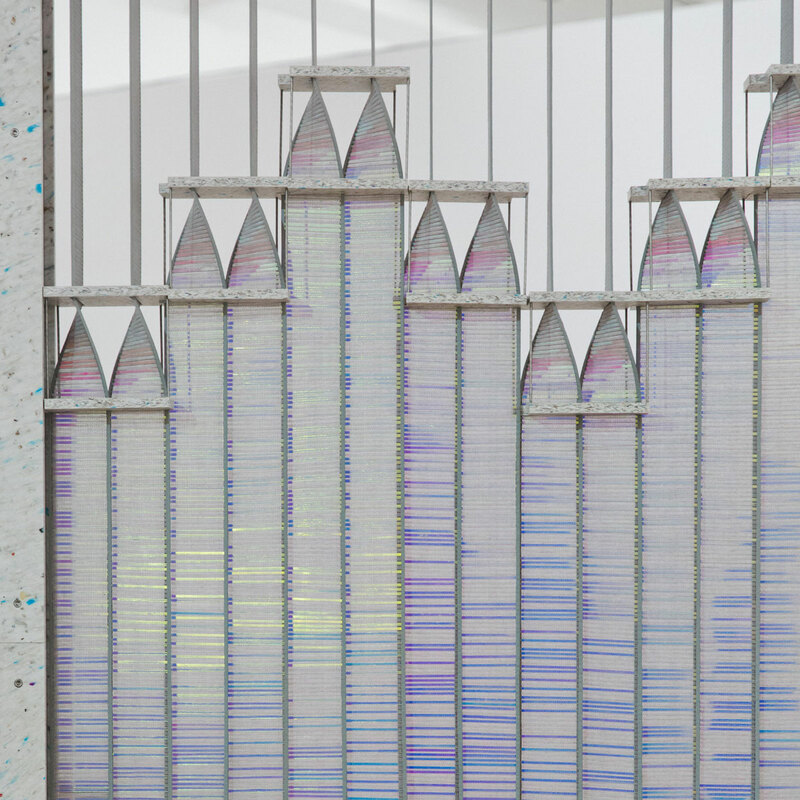 Each panel encapsulates thousands upon thousands of coloured acrylic tiles within knitted cotton. 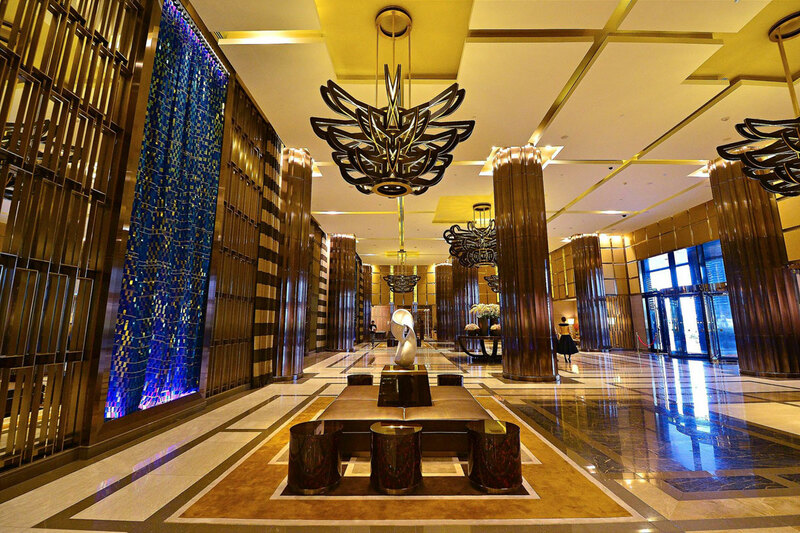 The panels are hanging in a hotel lobby in Manila. 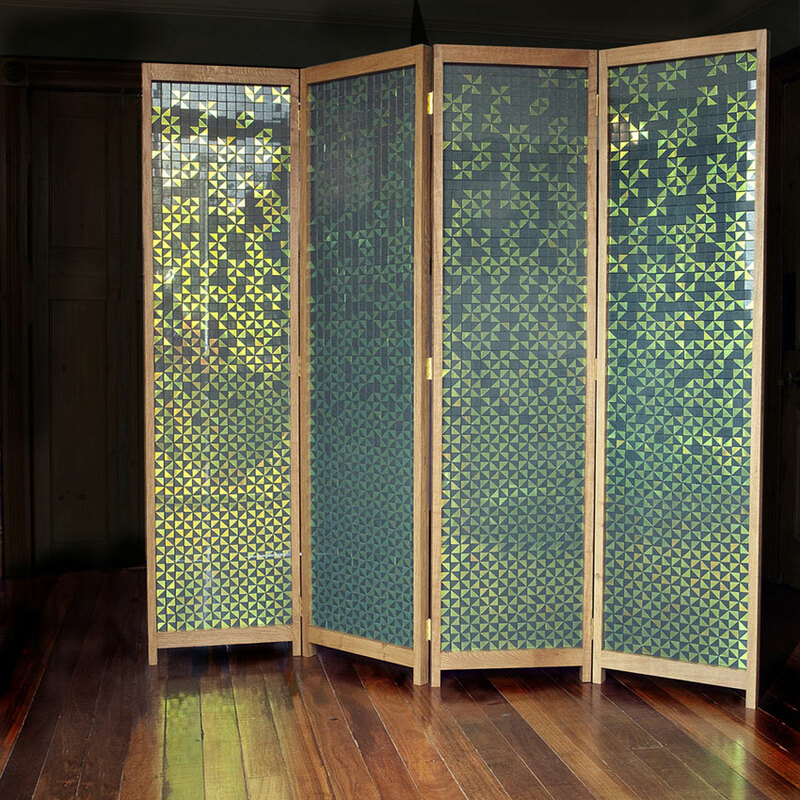 Copper Screen is an oak-framed room divider. To create the piece, thousands of copper shapes were arranged in an arabesque-inspired pattern under a layer of fine knitted cotton, resulting in a subtly gleaming surface that gives the impression of being three-dimensional. Made to measure Celeste Blind uses traditional knitting methods to create a dramatic wall hanging or roman blind that shifts colour with the changing light. Examples of our knitted textiles. 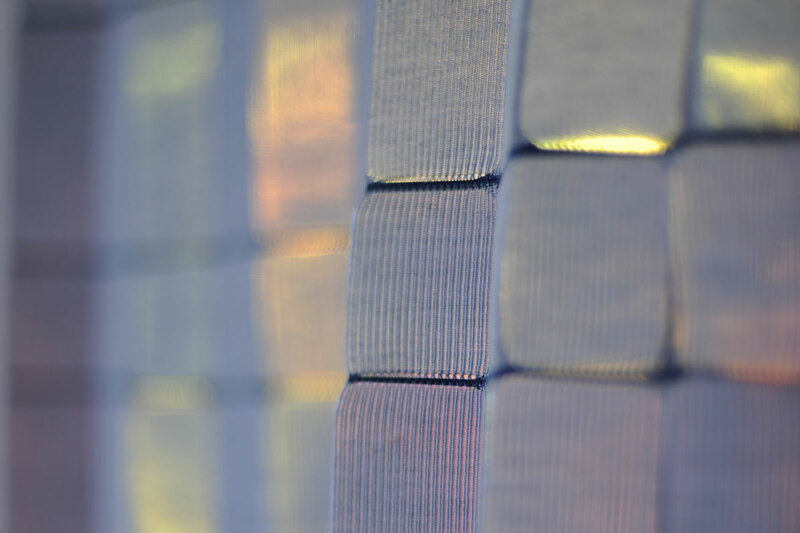 These textiles are handmade by knitting rows of pockets with Italian cotton that embed various reflective materials. 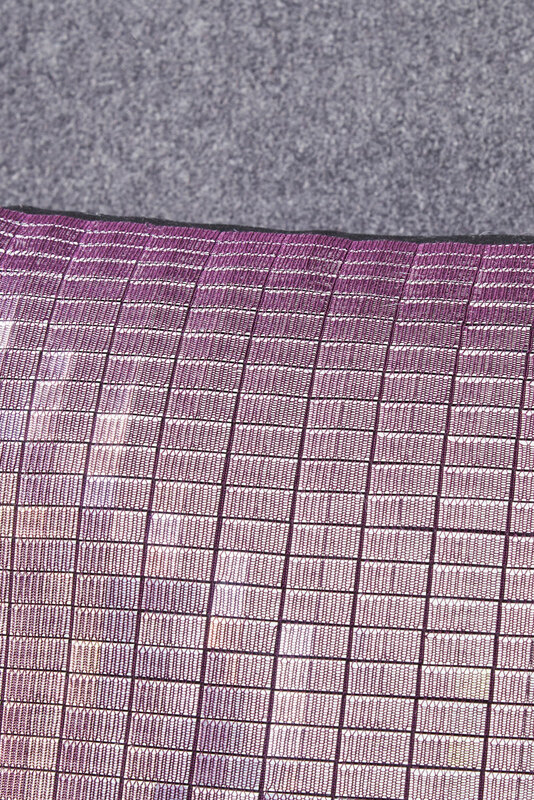 Examples of the patterns we can create for fabrics that are heat bonded rather than knitted. These fabrics are upholstered to boards for applications such as decorative wall tiles and door or cupboard panelling. 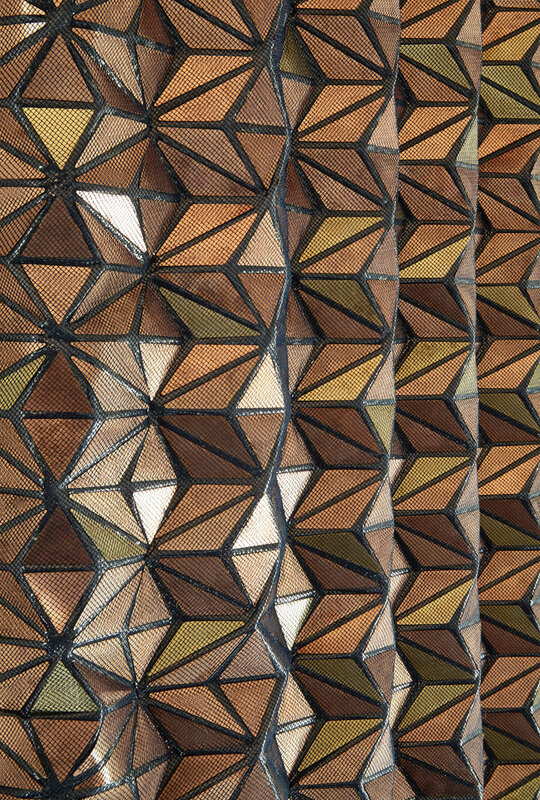 This modular wall covering consists of 25 handmade textile tiles measuring 40cm x 40cm. 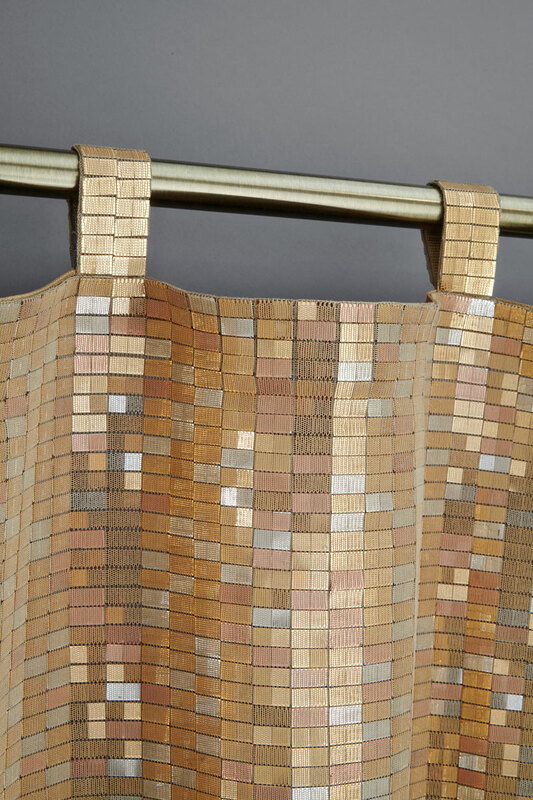 To create the piece hundreds of metallic shapes were embedded between a layer of cotton fabric and fine netting. 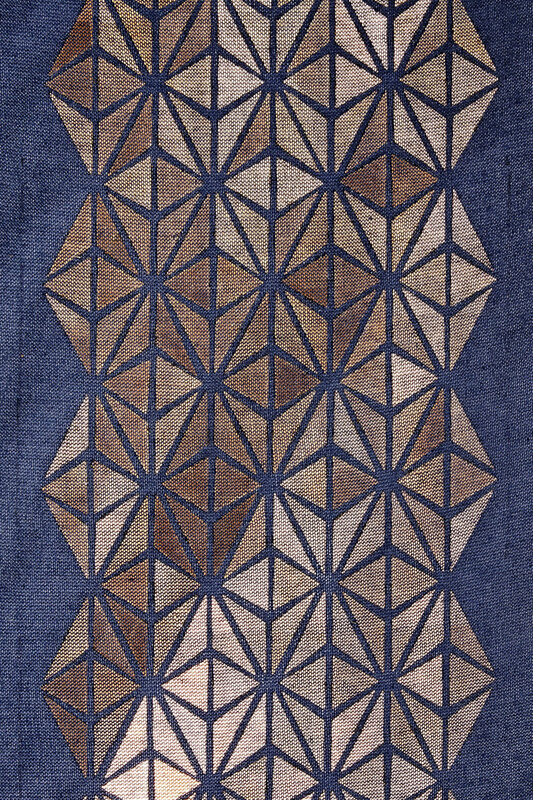 The pattern was inspired and created during my time spent at Tashkeel Gallery in Dubai where I was artist in residence. 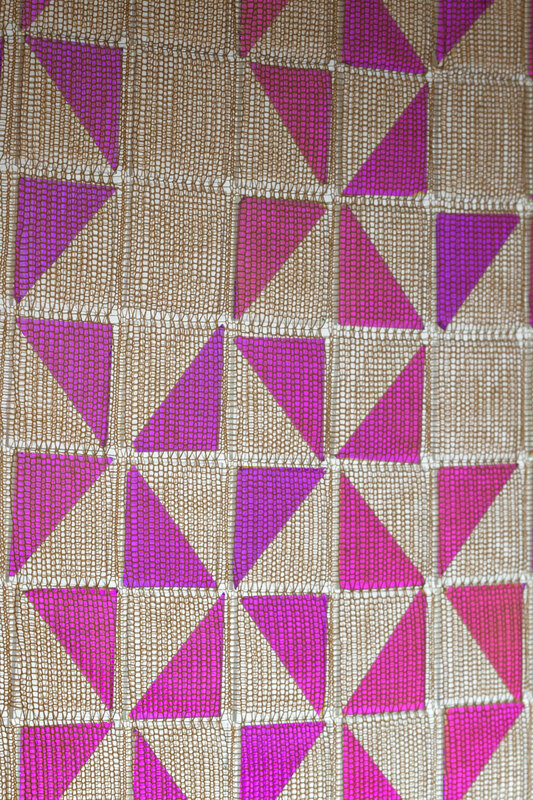 A large geometric pattern formed of hundreds of small iridescent acrylic squares arranged by hand within a knitted peach yarn. 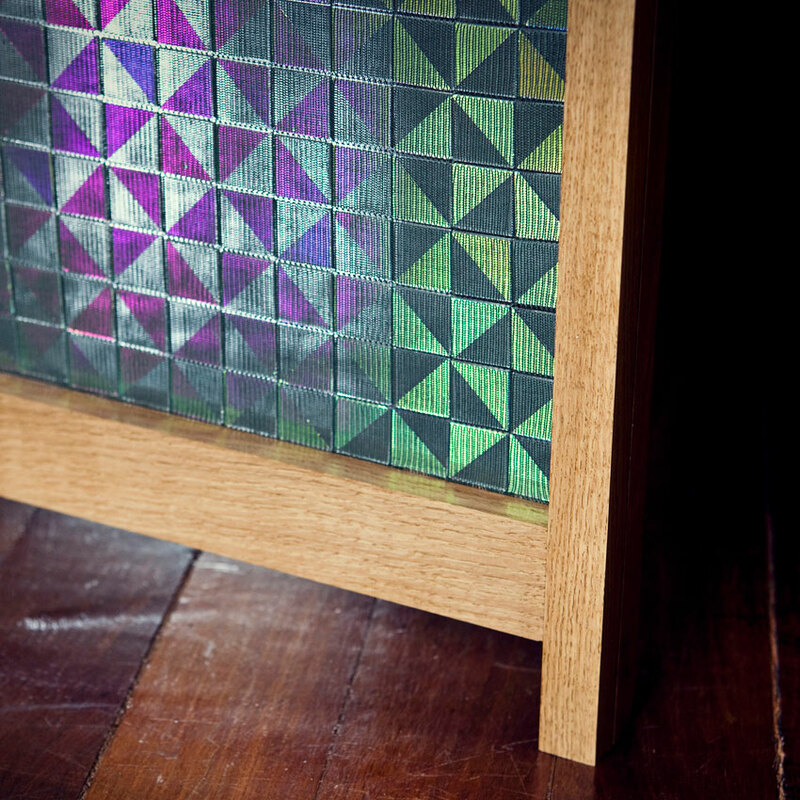 Backlit by LED's, the piece is framed in solid oak surround measuring 100cm x100cm. 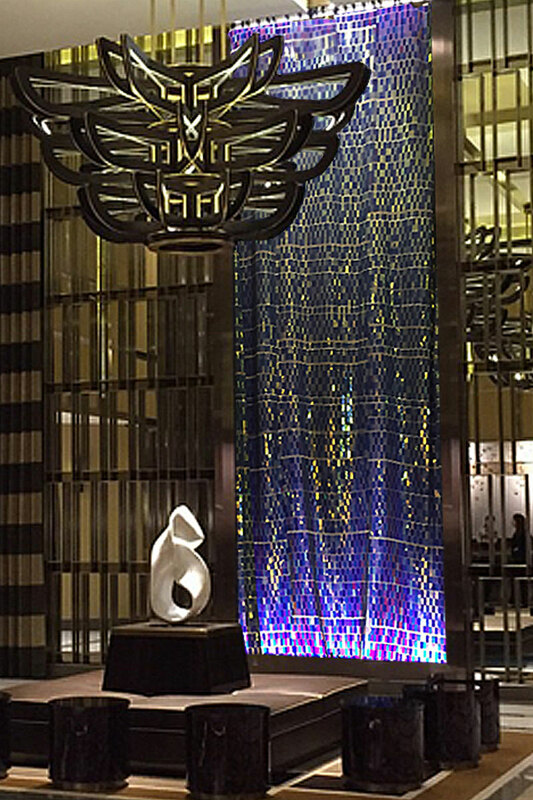 The diffusion of the lights encourages the pattern to shift subtly from purple to gold.